India has reassured Russia of its commitment to the Kudankulam nuclear power project, notwithstanding the protests against the plant. New Delhi reassured Moscow that there was no question of abandoning the Russian-aided project in view of the prolonged agitation. Russian Ambassador to India Alexandar Kadakin, meanwhile, backed Manmohan Singh's claim that NGOs based in the US were fuelling the protests at the Kudankulam nuclear plant. Hailing India�s anti-polio efforts, the World Health Organisation (WHO) today took the country off the list of nations with active endemic wild polio virus transmission. That leaves only Pakistan, Nigeria and Afghanistan on the list. 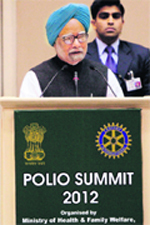 Health Minister Ghulam Nabi Azad broke the news after Prime Minister Manmohan Singh opened the two-day Polio Summit this morning. Pakistan today blamed the war on terror for delay in the eradication of polio and said it would seek India�s help in eliminating this disease from the country. 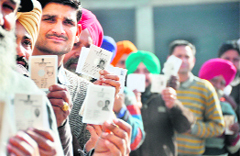 Candidates cutting across party lines appear restive at guidelines that expenses incurred by them even after the polling, would be added to their election expense by the Election Commission. A file photo of the recent Punjab elections. A Special Investigation Team (SIT) today seized several weapons from the Italian merchant vessel Enrica Lexie during a search to trace the firearms used by two marines who allegedly shot dead two Indian fishermen. 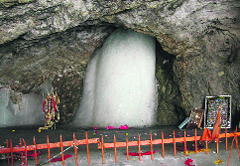 The annual pilgrimage to Shri Amarnath Shrine would commence on June 25 and culminate on August 2. It truly is a hair-raising story. Human hair offered by devotees at Andhra Pradesh�s Tirumala Temple has generated a huge demand in the global market. E-auctioning of the humble offerings of the pilgrims has fetched the Tirumala Tirupati Devasthanams (TTD), an autonomous body managing the affairs of the country�s richest temple, a whopping Rs 200 crore in 2011-2012 as against Rs 54 crore last year.